The campaigns this year have seen LGBT issues rise to the forefront, a result of March’s failed LGBT-inclusive non-discrimination ordinance. I’ll be liveblogging and tweeting throughout the evening. Follow along with updates here below or on Twitter @themattcomer for updates, news and analysis. Appreciate the special coverage through our unique LGBT and progressive lens? Click here to consider supporting my continued work by becoming a monthly patron or sending a one-time gift. The liveblog has been archived. Updates below as delivered in real-time are displayed with the oldest at top, newest at bottom. Hello all! Can’t wait to start the live coverage tonight. Be sure to follow along here or on Twitter @themattcomer. Polls close at 7:30 p.m., at which time results will start rolling in! Several election watch parties are scheduled tonight starting at 7:30 or thereabouts. • The TurnOUT Charlotte! coalition (Human Rights Campaign, Equality NC, MeckPAC) will host an event at All American Pub in South End. • The Young Democrats of Mecklenburg County will host an event at Heist Brewery in Charlotte. • Openly gay City Council candidate Billy Maddalon will host supporters at his VanLandingham Estate in Plaza Midwood. Democrats Dan Clodfelter and Jennifer Roberts both received LGBT-friendly endorsements. Will either of them take the prize or will David Howard’s last-minute surge in support bring him across the finishing line? Another possibility — a run off featuring two of the three. On the Republican side, I’m predicting that Edwin Peacock III takes home the vote, but we’ll see if far-right, anti-LGBT opponent Scott Stone is able to deliver a surprise. A cramped slate of Democratic candidates are vying for four spots on the general election ballot. I’ll be paying close attention to TurnOUT Charlotte! endorsed candidates — Julie Eiselt, Vi Lyles, Billy Maddalon and James Mitchell — as well as candidates Bruce Clark (who I personally endorsed) and Claire Fallon, an incumbent who received a great deal of criticism following the failed ordinance vote in March. 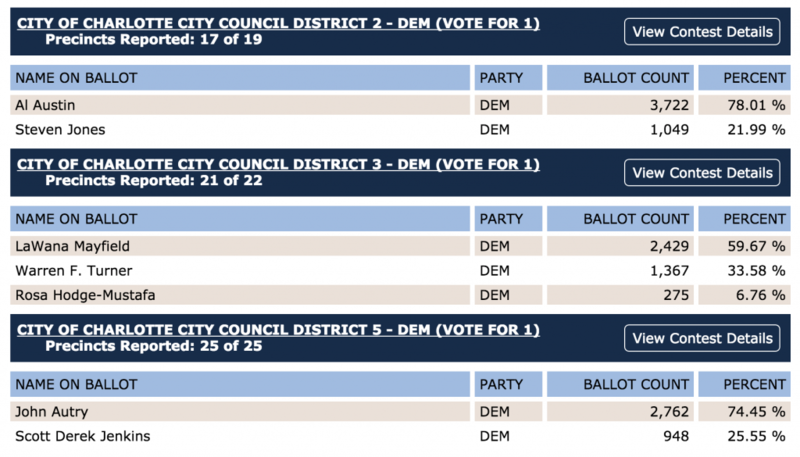 Will the city’s two incumbent gay and lesbian candidates — LaWana Mayfield (3) and Al Austin (2) — keep their seats? I’ll be following them and strong LGBT ally John Autry (5). You have a little over 30 minutes left to vote. Not sure where you need to go? Use this voter search from the state board of elections to point you in the right direction. Polls close at 7:30 p.m. and as long as you’re in line at that time, you can cast a ballot. Your vote will mean a lot today, as voter turnout is expected to be low. First stop of the night: Mecklenburg Young Democrats election watch party. Folks slowly starting to trickle in, including the first candidate to make an appearance, at-large candidate Julie Eiselt. Young Dems are busy in the corner setting up the livestream of local news and election results. Edwin Peacock has huge lead on Scott Stone in Republican mayoral primary. Early vote totals for Democratic at-large candidates show Vi Lyles, James Mitchell, Claire Fallon, Julie Eiselt in the lead. Three of the four were endorsed by the LGBT GOTV campaign TurnOUT Charlotte! (Fallon is the lone non-endorsed candidate. 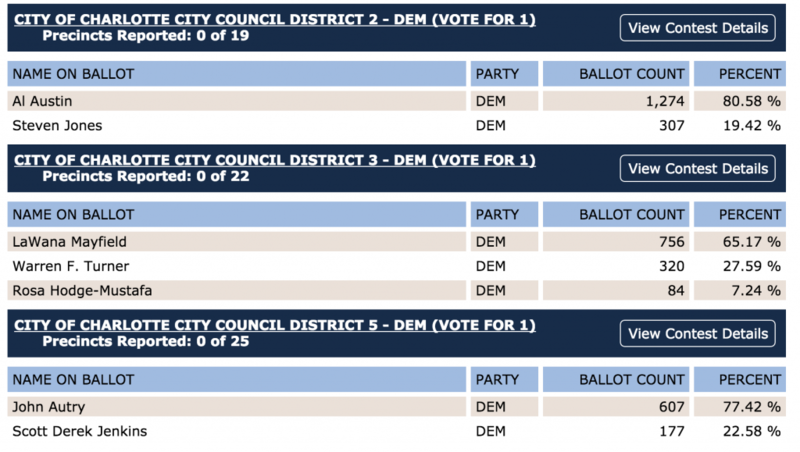 If early vote totals stay constant all night, three LGBT-endorsed district candidates – LaWana Mayfield, John Autry, Al Austin – will return to their Council seats. Mayfield and Austin are the Council’s two openly LGBT members. More on those district races — LaWana Mayfield, John Autry, Al Austin are leading by wide, wide margins. I can’t imagine day-of voting will make up those differences if the trend favoring the three candidates held, and there’s no reason to think it won’t. Just popped into the TurnOUT Charlotte election watch party. Several endorsed candidates present, including James Mitchell and Julie Eiselt, along with Billy Maddalon and Al Austin. TurnOUT Charlotte was the LGBT get out the vote coalition comprised of the Human Rights Campaign, Equality NC and MeckPAC. TurnOUT Charlotte event has good showing of HRC, MeckPAC and EqualityNC staffers and volunteers, along with those fore mentioned candidates. Other guests at the TurnOUT Charlotte event include local LGBT leaders like Chad Sevearance of Charlotte Business Guild and Aisha Dew, former Mecklenburg County Democratic Party Chair. Marty Rouse, HRC’s national field director is also in town for the election night event. As results still trickle in, candidates and LGBT organization staff are having bites to eat and a few early drinks (that I’m assuming they’re hoping will turn celebratory as the night continues). Party being hosted at All American Pub in South End. Organizers are asking supporters to join them! It’s probably going to be a somewhat long night! From left to right: Council candidate Julie Eiselt, Human Rights Campaign Board of Governors member Jeremy Carter, HRC’s southern regional field director Joe Saunders, HRC/TurnOUT field organizer Ryan Rowe, Council candidate Al Austin, MeckPAC chair and HRC Board of Governors member Scott Bishop, Council candidate Vi Lyles, MeckPAC vice chair Jamie Hildreth, Council Candidate Billy Maddalon and Equality North Carolina executive director Chris Sgro. Latest updates on at-large races — Billy Maddalon had been seventh. He’s risen to fifth. Only four can go on to the general election. Claire Fallon (not endorsed by LGBT organizations) is currently fourth. Top three so far are LGBT-endorsed candidates. BIG jump in reported precincts. Maddalon is still fifth, but Fallon’s lead over him has grown significantly. Incumbent Dan Clodfelter and candidate Jennifer Roberts both received LGBT-friendly endorsements. They’re currently first (Roberts) and second (Clodfelter). Roberts holding steady at 36 percent. Clodfelter at 27 percent. Roberts needs at least 40 to avoid a run-off with Clodfelter. TurnOUT Charlotte endorsed candidates were Eiselt, Lyles, Maddalon, Mitchell. Maddalon is the only one not in top four so far. He’s in fifth. LGBT org staffers with TurnOUT Charlotte still confident Maddalon could rise to fourth. Endorsed candidates were Mayfield (3), Austin (2), Autry (5). They’re carrying large leads over their challengers. No worries in these races. LGBT org staffers at the TurnOUT Charlotte election watch party don’t seem worried. With 68 of 168 precincts reporting, Claire Fallon’s lead over Billy Maddalon has risen to about 1,000 votes. It’s still possible for Maddalon to pull through, but he’ll have to have performed well in the remaining precincts yet to report. If you’re curious why the focus right now is Fallon v. Maddalon, here’s some background. Maddalon is openly gay and an advocate for March’s failed LGBT-inclusive ordinance. Fallon was rumored to be the lost sixth vote on the ordinance. Rumors shared on Facebook all point the finger for the lost vote at Fallon, but no one was willing to go on-record with me to confirm those rumors. Fallon emphatically denies it, telling me and others that she was never asked to support the full package, despite what seemed like her own enthusiastic support for the measure in preliminary meetings leading up to the March 2 vote. Fallon has an entirely different theory on why the proposal failed, pointing the finger squarely at LGBT advocates themselves. Vi Lyles, James Mitchell and Julie Eiselt (if not also Claire Fallon) are nearly guaranteed to take Council seats in the general election (unless a Republican is able to pull off an at-large victory, which hasn’t happened the last couple election cycles). With at least Mitchell and Eiselt, we effectively replace two unfriendly votes (Michael Barnes and David Howard, both running for mayor) with two friendly votes. That brings us closer, if not completely, to ensuring a solid six votes for the proposed LGBT-inclusive non-discrimination ordinance. Still not much change for Billy Maddalon. In fact, Fallon has continued to increase her lead. Here are the remaining precincts yet to report (in gray). I can’t imagine there are 2,000 votes for Billy Maddalon here. 146 of 168 precincts reporting. Jennifer Roberts and Dan Clodfelter have remained steady at one and two. Roberts does not have enough to avoid a run off, and the mayoral Democratic primary most definitely seems headed that way. Some analysis: That’s not good news for Clodfelter, given Roberts’ more robust campaign apparatus. In order to win in a run-off, a candidate will have to focus on get out the vote efforts. I just don’t see Clodfelter doing well against Roberts. The only chance Clodfelter might have is to gain endorsements from other mayoral candidates who don’t make it to the run-off. In the Republican mayoral primary: Scott Stone, the far-right Republican challenger to Edwin Peacock, has offered his congrats to Peacock. Stone had received endorsements from anti-gay extremists like First Baptist Church Charlotte Pastor Mark Harris. Stone was decidedly opposed to all LGBT equality measures. You might not agree with everything Edwin Peacock espouses. I certainly don’t. I disagree with his positions on transit and several other important economic development issues. But Peacock is authentic, he is committed and he is loyal to Charlotte’s people. In 2013, he was far more progressive on issues like corporate incentives than even some Democratic candidates. His positions on these issues have remained constant, as has his general acceptance and affirmation of the LGBT community. He does not favor the originally presented ordinance and he has hang ups on transgender inclusion. This is a problem, I know. But for Charlotte voters in the Republican mayoral primary, Peacock is the obvious choice, especially in comparison to his opponent Scott Stone, endorsed by radical anti-LGBT extremists like First Baptist Charlotte Pastor Mark Harris. If I were voting in the Republican mayoral primary, I would cast my ballot for Edwin Peacock III. If you’re a Republican or unaffiliated voter choosing a Republican ballot on Tuesday, I encourage you to vote for him. With 97 percent of precincts reporting… I think the night is just about over. Democratic mayoral: Roberts and Clodfelter head to run-off. Democratic at-large: Lyles, Mitchell, Eiselt and Fallon win. Democratic district races: Austin, Mayfield and Autry fend off their challengers. Latest update from an LGBT org staffer: The race between Claire Fallon and Billy Maddalon might not be settled. According to sources, there could be a run-off in the Democratic at-large races. Unclear on the details. Updates later. The TurnOUT Charlotte party has turned celebratory. LaWana Mayfield is celebrating her primary victory. With 100 percent of precincts reporting, LGBT advocates on the local, state and national level are celebrating a victory for their local get-out-the-vote efforts. 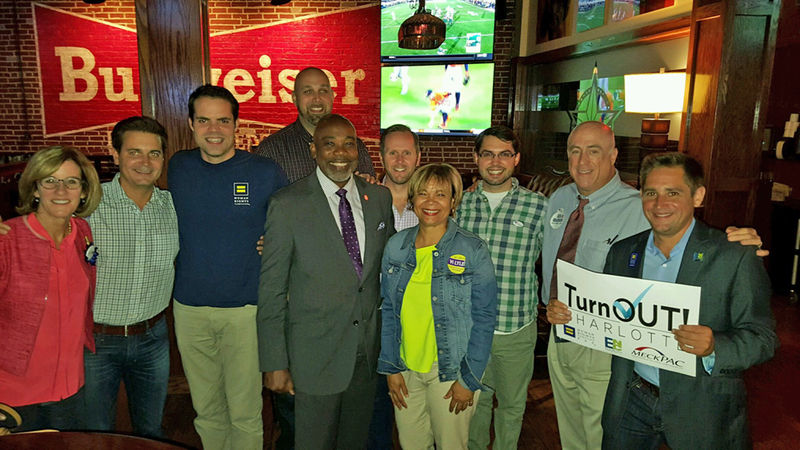 Last month, the Human Rights Campaign, Equality North Carolina and the Mecklenburg LGBT Political Action Committee (MeckPAC), joined forces to endorse a slate of at-large Charlotte City Council and district candidates. The coalition effort came in response to a failed LGBT-inclusive non-discrimination ordinance effort in March. Protections in public accommodations and in other services were rejected by City Council. Advocates hoped to ensure a six-plus majority vote for future ordinance efforts. On Tuesday, evening, they said they reached that threshold. Three of the coalition’s endorsed at-large candidates sailed to victory tonight — Vi Lyles, James Mitchell and Julie Eiselt took the top three spots in a four-way Democratic primary race. A fourth candidate, Claire Fallon, might face a run-off with openly gay and TurnOUT-endorsed candidate Billy Maddalon. LGBT advocates have said the race is “too close to call,” and Maddalon might request a a run-off. CHARLOTTE, N.C. — Tonight, TurnOUT Charlotte, the first of its kind coordinated campaign applauded the Charlotte municipal primary results. The campaign — a partnership of Equality NC, MeckPAC, and the Human Rights Campaign — is praising the victories of candidates who have pledged their support for an LGBT non-discrimination ordinance. While some are expected to face challengers in the general election, all are widely expected to take seats on the Charlotte City Council. Together, these winning candidates will make up a pro-equality majority. Candidates endorsed by the campaign who won tonight include: Vi Lyles, James (Smuggie) Mitchell, Julie Eiselt, Al Austin, LaWana Mayfield, and John Autry. While the results of the fourth seat for the at large race looks too close to call, we hope Billy Maddalon will pursue the possibility of a run-off election. Over the last 4 weeks, the campaign has been talking to voters in the Queen City on behalf of endorsed city council candidates on the phones and at their doors. The campaign was focused singularly on election of a pro-equality city council that will prioritize a vote for and pass non-discrimination protections that extend to LGBT citizens of Charlotte. There’s not much more I can offer for election coverage tonight, folks. Here are the results as reported by the board of elections tonight. I’ll have a wrap-up and follow-up in the morning. Thanks for following along. Appreciate the special coverage through this unique LGBT and progressive lens? Click here to consider supporting my continued work by becoming a monthly patron or sending a one-time gift.